Jackie Ramirez, PA-C - Reflux, Stomach Pain, Ulcers - Paul Arnold, M.D. 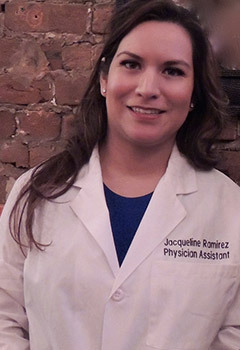 Jackie Ramirez, PA-C was born and raised in Virginia. She received her Bachelor of Science degrees in Neuroscience and Public Health from the College of William and Mary. She then completed a Master of Science degree in Infectious Diseases from Georgetown University. After graduation, she completed a fellowship at the Centers for Disease Control and Prevention in Atlanta, Georgia. In order to practice direct patient care, she went on to earn a Master of Physician Assistant Studies from James Madison University. Her interests include understanding the Mind-Gut connection and the way microorganism interact with the human body. In her spare time, she enjoys spending time with family.